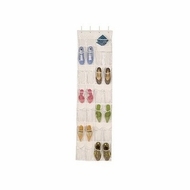 Richards Homewares - 2549W Features: -Protects from dust, dirt and moisture.-Easy storage.-Garment storage / organizers.-Hangs on the back of the door with four heavy duty hooks.-Holds 12 pairs of shoes.-Wipes clean with damp cloth. Construction: -Crystal clear vinyl construction. Collection: -Clear Vinyl Storage collection.